I am not a big sports fan, I don’t follow any teams, but I do find the economics of sports to be highly interesting. Earlier this week Floyd Mayweather tweeted that he made 32 million in 36 minutes and pending results of the Pay Per View take, may earn $70 million total for that 36 minutes of work. Although this is an amazing amount of money, he didn’t earn it all on Saturday night. He started boxing as a kid, he put in thousands of hours of training and focused development long before he made his first dime. He fought as an amateur and after four more years of hard work turned pro. He won $150,000 in his 18th fight as a pro when he won his title. He trained more, he fought more. He travelled from home to go to fights. Every win increased his rank, and therefore his pay. My point is that TODAY he earned $1 million a minute, but to get there he had to earn $0 an hour for tens of thousands of hours. Being a professional athlete, like many careers, requires a large base of time, effort, and discipline put in long before the big bucks start flowing. The Silver gloves are a younger division than the golden gloves. In 1996 these men were at the same point in their careers. They both put in tens of thousands of hours of hard work and were the best in their respective ages and weight classes. In 1996 both men turned pro and won their first fight. Burton then took a leave from boxing to go back to school. He took a tradeoff in his prime boxing years and missed 3 years. By the time he returned to boxing in 1999 Mayweather had already earned his first title and was making over $100,000 a fight. Burton won his next 14 fights. He lost one fight, then won his next two and in 2003 beat Angel Manfredy, greatly increasing his ranking. After winning this fight he even called out Floyd Mayweather to fight him, but that fight never took place. At this point in time Mayweather was exceeding $1 million a fight. Courtney then won his first professional title, the WBO NABO lightweight title against Francisco Lorenzo. Both men were champions, but took different paths. Burton then had a string of bad fights, and exited boxing. Courtney made some decent paydays, but he never saw the 7 figure paydays that Mayweather enjoys. Would things have been different if Burton hadn’t dropped out for 3 years in his prime? In 2011 Burton started working at First Chance Boxing Inc in Benton Harbor MI as a coach and mentor for area kids. The reason Mayweather is able to earn what he does is because not only was he able to build the base of hard work and time put in in his early days, he has been able to stay on top for 2 decades. These sports take a massive physical and emotional tole on people. Here is an excellent info graphic on Mayweather’s boxing career. Mayweather also is extremely smart when making his deals. 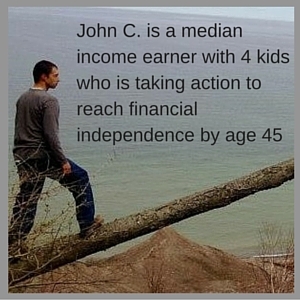 His contracts are set up so that when he fights, the lions share of earnings go to him. To me this makes a lot of sense, and of course he would not be in the position to demand such things if he weren’t at the top of his game for so many years. Do these athlete’s deserve to earn hundreds of millions of dollars? We as a society decide to pay hundreds of millions of dollars to watch these men fight, and I think it’s only fitting when they get a large percentage of it, they are providing the entertainment and we are paying good money for it. With that being said I don’t pay for professional sports channels, or merchandise, and certainly not for $75 pay per view fights. Of course Mayweather only gets to keep a small percentage of the fight income he makes. His effective tax rate on a $70 million win is well over 50% when you include federal income tax and self employment tax. He also has to pay managers, promoters, and trainers, so with a $70 million payday he may only end up seeing $25 million to $30 million. Mayweather is the highest paid athlete in sports right now, what do you think about the large paydays professional athlete’s receive? Update: While researching Muhammad Ali, I just found out that Mayweather earned more in this one fight than Ali did as a boxer in his lifetime, crazy! 11 Responses to "$70 Million Paycheck"
Yeah, sure is. Another thing about Courtney is that when he was working with me he never projected himself in an arrogant way, he worked hard while he was there and never acted like he was too good for it, he was just doing what he needed to do at that point in time to move forward in life. I respect him even more. What an amazing person. Man… that is a crap load of money! 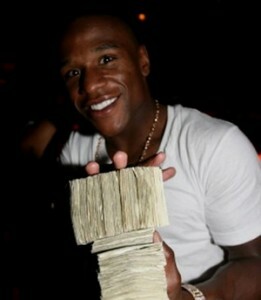 I saw Floyd “make it rain” with a huge stack of hundred dollar bills at a club once in Vegas. It is amazing what some professional athletes make, and this is just from winnings, not including any endorsement deals or business ventures. It will be interesting to see what Mayweather does after he retires (and when that will be). He has a lot of untapped potential for endorsements if he ever decides to go down that route. Talk of that much money saddens me. It cheapens the sport down to the level of greed and waste. The pyramid for boxing is flat and so few make it to the apex, which makes me think of all the other athletes who never get recognition for the amazing dedication they show for the sport. That is also true for many other sports. My hope is that most athletes are in it for the pure enjoyment of it and not the pursuit of a big pay day. Unfortunately, the media make the latter more likely. It is crazy how lopsided sports pay is, especially in individual sports such as boxing. #1 may make a couple hundred million this year, while #20 is struggling to pay his bills. A lot of this comes from the demand side. People just don’t want to pay $75 for a pay per view match between #35 and #57, nor several hundred to watch it in person. I think it is crazy myself the demand to watch these sports, which allows for this much money to flow through. I do think that if the money is being paid for the fight, then the actual fighters should be earning the lions share, and not the managers, promoters, Showtime, etc. I do think that athletes “somehow” deserves what they got because of their hard work, but for me they’re just there to showcase their skills and talent to entertain people. Paying someone that much is what I’am against to, and the fact that Mayweather isn’t great at managing his finances makes things worse. He should be inclined to donate to charity and not just buy expensive items that he only be using once. Such a waste, but it’s his money, so I can’t do anything about that. I think a lot of how Mayweather manages his money is for show, to keep up an image, similar to how Jay Z always shows himself spending money (think the Big Pimpin’ video), yet Jay Z is constantly hustling and starting new business endeavors and has an estimated net worth of over $500 Million. Poor money management among athletes and celebrities is nothing new though, and part of his poor habits I’m sure stem from his humble upbringings. A lot of these men who turn into sports stars start from nothing and have never seen or been taught by someone who isn’t trying to get a piece of their money, how to properly manage it. I hope for his sake he manages the money he will earn in the next couple years well, I would hate to see him end up like Tyson. Thank you for stopping by and joining the discussion! I’m always amazed with athletes pay, one thing everyone leaves out of the equation is the short term career of professional athletes. A great comparison was made with Burton, he had a small window to make money after that he is expected live on that for his lifetime or return to work assuming he is able. Not everyone boxes for 10 years and make millions, he is one in a million. Very True, most professional athletes have short careers, Golf is one of the few exceptions where people can play for a long career. Boxing and Football of course have very short careers. I don’t know if this was the case with Burton, but with many boxers and football players the physical tole they take as an amateur leaves them with long term ailments before they have a chance to turn pro. It isn’t uncommon for high school or college football players to have career ending or at least career inhibiting injuries well before getting a shot to make any money. Thank you for joining the discussion!